Tomlin has enjoyed an extraordinary career spanning all facets of the entertainment industry including feature films, television and theatre.Tomlin made her film debut as Linnea, a gospel singer and mother of two 2 deaf children in Robert Altman’s Nashville” (1975). Her performance was so memorable that she was nominated for an Academy Award and voted Best Supporting Actress by both the New York Film Critics and the National Society of Film Critics. Bea Lillie, Imogene Coca and Jean Carroll, on of the first female stand-ups on “The Ed Sullivan Show.” After high school, Tomlin enrolled at Wayne State University to study medicine, but her elective courses in theatre arts propelled her to leave to become a performer in local coffee houses. She moved to New York in 1965, where she soon built an Improvisation, Upstairs at the Downstairs and Cafe Au Go Go. In 1966, she made her television debut on “The Garry Moore Show,” and in 1969 opened for the legendary Mabel Mercer in the Downstairs memorable appearances on “The Merv Griffin Show,” which lead to a move to California where she appeared on “Music Scene.” In December 1969, Tomlin joined the cast of the top-rated “Laugh-In” and overnight rose to national prominence with her characterizations of Ernestine, the sassy telephone operator, and Edith Ann, the devilish five and a half year old. Between 1973 and 1975, Tomlin co-wrote and starred in four comedy specials. Departing from the usual variety show sketch format, the productions, staged as innovative playlets, won four Emmy Awards and a Writers Guild of America Award. Tomlin’s comedy recording debut, “This is a Recording,” won a Grammy in 1971. Her subsequent albums “Modern Scream,” “And That’s the Truth” and “On Stage,” have all been nominated for Grammys. In 1977, Tomlin made her Broadway debut in “Appearing Nitley,” written and directed by Jane Wagner. Tomlin won her first Tony Award for “Appearing Nitely,” the play that has become the hallmark of the Tomlin/Wagner collaboration. In addition to such favorites as Ernestine, Edith Ann and Judith Beasley, the calumet city housewife, “Appearing Nitely” introduced Trudy, the bag lady, who later appears in “The Search.,” Crystal, the hand-gliding quadriplegic; Rick, the singles bar cruiser; Glenna, a child of the sixities and Sister Boogie Woman, a 77-year-0old blues revivalist. “Appearing Nitely” was then adapted as both an album and an HBO Special. The team of Tomlin and Wagner then produced an additional pair of TV Specials, the Emmy-winning “Lily: Sold-Out” (1981) and “Lily for President?” (1982). Tomlin is currently in production on a series of animated specials featuring one of her most popular characters — the precocious five and a half year old, Edith Ann. Do you want to hire Lily Tomlin? Directly request a quote. 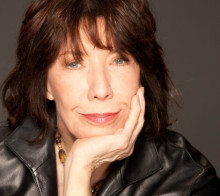 In 48 hours we can send you the availability of Lily Tomlin If you would like to book Lily Tomlin, Entertainment Booking Agency is the right place. We will offer you the best price and contact the management or we directly contact Lily Tomlin. For corporate appearances or speaking engagements you can contact our agents and the will help you true the process. Tags: hire Lily Tomlin, Lily Tomlin booking, book Lily Tomlin, Lily Tomlin appearances, find more information on booking Lily Tomlin for appearances, Lily Tomlin speaking engagements, Lily Tomlin endorsements/spokesperson, Lily Tomlin appearance fees, Lily Tomlin booking agency contact info, biography of Lily Tomlin, Contact an artist booking talent agent find a speakers bureau that can book Lily Tomlin, speaker booking agency for Lily Tomlin, Lily Tomlin booking agency, Lily Tomlin booking for corporate event. EBA is one of the biggest entertainment booking agencies in the World. We book hundreds of celebrities, artist, athletes and speakers in a year. Important to know is that we are not claiming to be the management of Lily Tomlin. We are not the official agent for Lily Tomlin. Companies from around the globe book these artists and speakers true our company be course we have one of the biggest networks and we always have direct contact with the artist or the management. We help you to find the right celebrities for your corporate of private events. Please contact one of our agents to get free advice and we will help to get the world-famous artist on your party.